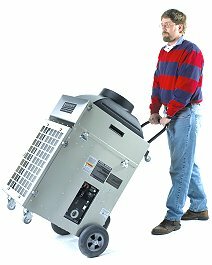 Abatement HEPA-AIRE Portable Air Scrubbers (PAS) are the number one choice of professional contractors for capturing and controlling mold, hazardous airborne contaminants and odors. The PAS units provide true 99.97% HEPA filtration and negative pressure controls in a lightweight, portable configuration that is easy to move to virtually any job site. 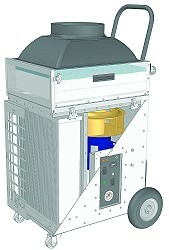 Abatement Technologies engineers developed the first HEPA-AIRE PAS units in the early 1990s. Compared to negative air machines of the day, our HEPA-AIRE PAS units were designed to be more functional, portable and user-friendly. Today, hundreds of refinements later, HEPA-AIRE PAS have become a ‘must have’ tool for serious professionals. For most contractors, Abatement’s Portable Air Scrubbers are the first pieces of equipment to arrive on almost every job–and the last to leave. With millions of hours of reliable on-the-job performance, customer satisfaction with Abatement HEPA-AIRE PAS is unsurpassed. Here are just some of the reasons that make the HEPA-AIRE PAS units one of the most valuable, productive and profitable tools your business can buy. Upright, narrow profile designs with built-in transport dollies and soft rubber tires enable one person to almost effortlessly roll the units “wheelbarrow style” to wherever they are needed, without lifting or carrying. With such ease-of-mobility, these powerful units can get into tight spaces not accessible to other filtration units. Abatement HEPA-AIRE PAS models feature up to four stages of filtration, including true Type A HEPA filters, individually tested and certified to a filtration efficiency of 99.97% or greater at 0.3 microns, as per IEST-RP-CC001.3 requirements. HEPA frames are metal, so they won’t support microbial growth. High-capacity, economically priced prefilters are designed to last longer, and reduce replacement filter costs. Internal cabinet areas downstream from the HEPA filter are kept under positive pressure, so particulates cannot be pulled into the cabinet, bypass the HEPA and contaminate exhaust air. Aircraft-type solid rivet construction and closed cell gaskets between critical seams further ensure leak-tight cabinet integrity. Sealed control compartments prevent leakage through or around panel components. Motors and blowers are designed to provide excellent initial airflow, and to maintain as much of this output as possible throughout the filter loading cycle. This added power further extends filter life and can potentially save hundreds of dollars or more in annual filter replacement costs. An air filtration unit that breaks down frequently or lasts only a few years can turn yesterday’s ‘great deal’ into a terrible investment. With features like tough and mar-resistant cabinets, “over-engineered” components, no-maintenance impellers and aircraft-type construction, HEPA-AIRE PAS are designed for many years of on the job use with minimal maintenance or downtime. Features like the high-gloss, easy to clean, .040” stainless steel cabinets, high-tech designs, and superior workmanship and finish convey a positive company image, and emphasize the value of this equipment to customers and insurers. HEPA-AIRE PAS have been tested by Environmental Testing Laboratories (ETL), a Nationally Recognized Testing Laboratory (NRTL), and carry the ETL (U.S.) and ETLc (Canada) marks certifying that they comply with applicable OSHA and CSA electrical safety standards. Five North American models meet airflow requirements for the smallest jobs, the largest jobs and all jobs in between. In addition, most models are available by special order for operation at 220V-230V/50-60 Hz and 100V/50-60 Hz. The PAS pulls in contaminated air, filters out contaminants and propels the filtered air outside the containment zone through flexible ducting to negatively pressurize the work area. Inlet ducting is used to pull contaminated air out of the zone to negatively pressurize it. Contaminants are removed by the PAS unit which is typically located adjacent to containment barrier so contaminated air can be fed directly into the inlet. Filtered air is ducted outside or to another area as required. The PAS is located within the containment zone with no inlet or exhaust ducting, so there is no affect on room pressurization. The PAS accelerates the removal rate of airborne contaminants. HEPA-AIRE portable air scrubbers can also be used to create and maintain positive pressure zones. This wall-mounted unit is designed primarily for permanent or longer-term applications. It is compatible with Johnson Controls Metasys 3N2 networks; a LAN module is also available. Smaller or shorter-term mold abatement projects also require ongoing pressure monitor to verify that proper pressure relationships are maintained. The new HCPDPM portable model provides the perfect solution for these applications and for situations where multiple areas must be monitored. The high-tech IS5000 video inspection system is designed to provide mold remediation and facility restoration contractors, consultants, facility engineering and maintenance departments, insurance companies and building inspectors with a reliable and minimally invasive method for finding hidden damage or contamination. Compact, lightweight and easy-to-use, the IS5000 is ideally suited for locating, identifying and documenting problems such as water or moisture damage or mold growth in wall cavities and other spaces that are hard to see or reach. Abatement HEPA-AIRE HEPA vacuums are designed to remove airborne particles that settle onto floors and other surfaces. Abatement Technologies offers two standard models; A canister-style portable unit, and a hip-mounted backpack unit. Models for clean rooms and hazardous environments are also available by special order. Both models come equipped with complete tool kits. The eight-gallon V8000WD canister style HEPA vacuum is the most popular and versatile model. This wet/dry unit provides excellent vacuum power (120 cfm, 90 in. wg) in a durable and extremely compact and lightweight (22 lbs.) At only 59 dBA, it is also much quieter than most other HEPA vacuums. The lightweight V1300H hip-pack vacuum (just 6 lbs.) provides maximum user flexibility and mobility. This HEPA unit is ideal for applications when cleanup must be done in especially difficult to access areas, or in elevated areas that must be accessed via ladders or scaffolding. The MP3000 is an extremely useful tool when large volumes of water must be cleaned up and impurities removed. Mounted on a portable cart, this unit combines a high-capacity sump pump and vacuum system in one unit. The pump can operate simultaneously with the vacuum, or independently. It can move up to 3,000 gallons of water per hour, and discharge up to 23 ft. vertically, or 300 ft. horizontally. The MP3000 filtration is not HEPA efficiency. Tool kit is included. Discharge hose must be purchased separately. Note: The MP3000 filtration is not HEPA efficiency. Construction of rigid containment barriers is often impractical for isolating and containing contaminants and odors during smaller or shorter-term remediation or renovation projects. Even maintenance activities that require removal of T-grid ceiling tiles to access the space above necessitate containment of airborne particles. Abatement Technologies offers two, cost-effective temporary construction enclosures for applications where it is not practical to build a rigid barrier around the work zone. ZipWall is a versatile, easy-to-use protective containment system that protects your facility from harmful dust and airborne particles. The ZipWall system goes up easily in minutes without the need for special tools. Telescopic, twist-lock ZipWall Poles topped with the patented spring-loaded ZipWall Jack enables you to screen off your work area with plastic sheeting, light canvas tarp or drop cloth. TopSider allows you to perform operations and maintenance tasks within suspended ceilings without risking dust contamination to surroundings or patients. Consisting of a heavy-duty vinyl enclosure and a strong, extendable aluminum frame mounted on a mobile platform, TopSider delivers effective contamination protection in a portable, affordable package. Simply wheel the unit underneath a ceiling panel, zip the side opening shut, secure the spring-loaded seal against the ceiling and perform the maintenance task. The PC101 laser particle counter is a great diagnostic tool for tracking down contamination sources, and for measuring airborne particle counts before, during and after the job. It can measure up to 6 particle sizes simultaneously from 0.3 microns to 5 microns and larger. Contact Us for more information on the PC101 Particle Counter. 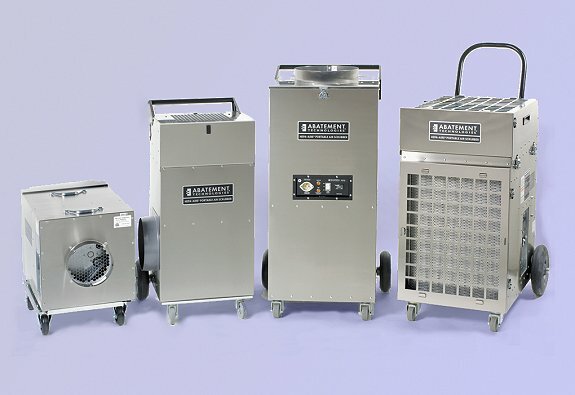 Abatement Technologies replacement filters, flex duct, collars and other accessories and ancillary products for HEPA-AIRE Portable Air Scrubbers are available. Contact Us or call us to receive detailed accessory availability and pricing information.